I have never had much exposure to Russian food. My experiences were limited to shashlik and stroganoff (and pelmenis which a home chef used to sell in Hyderabad for a short while) that too mostly in multi-cuisine restaurants with suspect authenticity. So, when friend Indrajit Lahiri of Moha-mushkil.com suggested that we meet at Milee Droog Cafe & Bistro, a Russian Café which has opened up inside Gorky Sadan, the Russian cultural center, I was very interested. Since the café was inside the cultural center which has a lot of Russian footfalls, the fare had a good chance of being authentic. So, on a cloudy afternoon of April, we reach Minto Park and after the requisite permissions from the Gorky Sadan gate (you need to take a gate pass to go in), here we were at the place. A very informal cafe with cozy and comfortable seating, this would seem like any newbie modern ones in your neighbourhood. A look at the menu, however, made me a bit apprehensive – only about fifteen items were there under the Russian menu, rest were the normal European food including pizzas and pasta. On querying, the wait staff told us that since a section of the visitors to Gorky Sadan were the usual teenagers and college goers with food not among their special interests, the café has something for everyone in the menu. However, we decided to ignore the other items and concentrate on the Russian food. 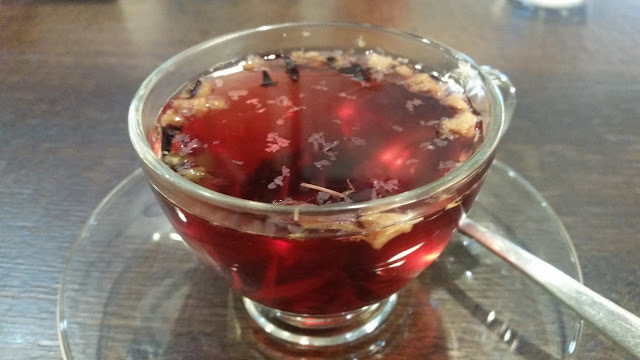 Indrajit told me that this place is known for their Russian Tea, and we decided to start with the same. 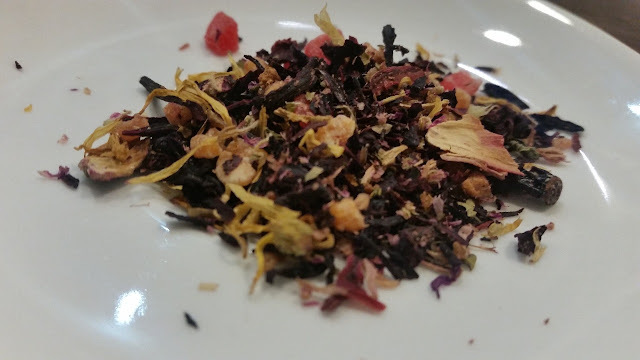 With dried berries, herbs and other fruits in it, the black tea had a unique and different flavour. Bits of dry fruits were floating on the tea, and as you drink the concoction they give out completely different flavours all together. The drink was eminently enjoyable for me. Our first order was for a Mushroom Bliny, which is essentially a stuffed pancake covered with cheese. Bliny is supposed to be one of the popular Russian dishes. A very simple dish with subtle flavours, the small chunks of mushrooms inside added a dimension to the taste-making us glad that we opted for it instead of the chicken variant. There were various versions of bliny in the menu – ham & cheese, chicken and even a sweet one. 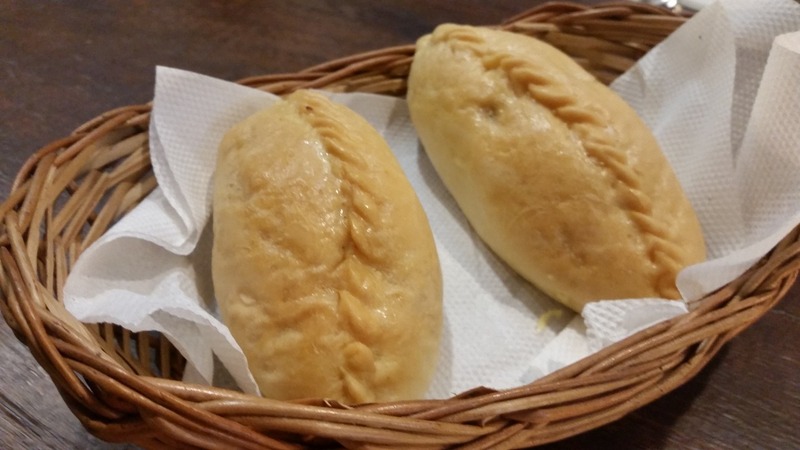 Pirozhkis are handmade bread stuffed with vegetables or meat. The one we ordered had a smooth oval shaped beaded bun with some delicious chicken mince with basic spices inside. It was a simple but wholesome snack. 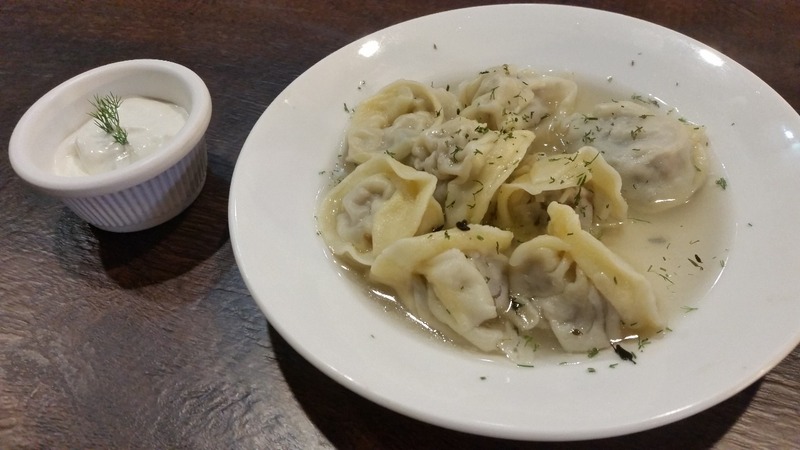 Next in were Pelmenis, Russian version of dumplings. The menu again had chicken and veg variants, but we opted for the pork one. 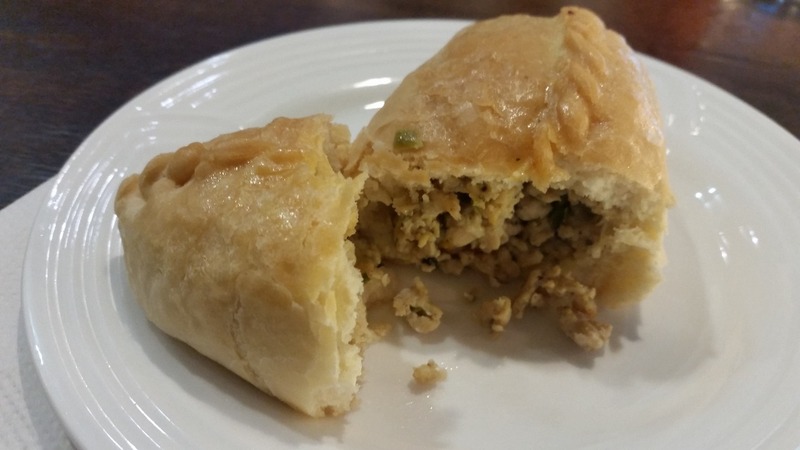 The dough dumplings stuffed with pork comes on a soupy base and is served with sour cream. The skin was thin and moist with the soupy base, while the pork filling inside had hardly any spoiler spices. Like everything we tasted here so far, it retained the flavours of its ingredients well. The main course we opted for was the Uzbek Lamb Plov. Now the name plov I guess has come from the same roots as our pulav (or Turkish Pilaf). The rice dish had onions, carrot, and meat with the meat stock in which it is prepared dominating the taste. 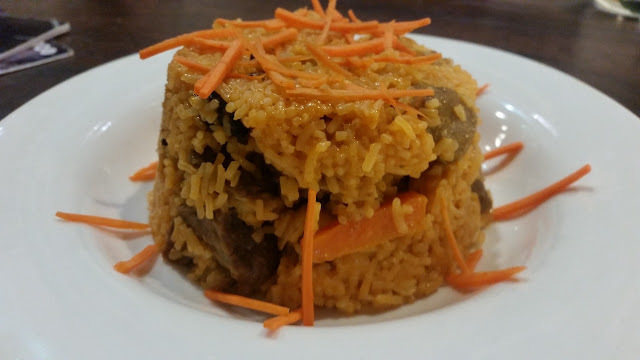 The dish for me was similar to the Mediterranean versions of rice and meat dishes sans the spices and nuts. It would delight a meat lover. By now we were quite stuffed. The Chicken Kiev and Tenderloin Stroganoff definitely looked interesting, but we had to postpone them for a later date. 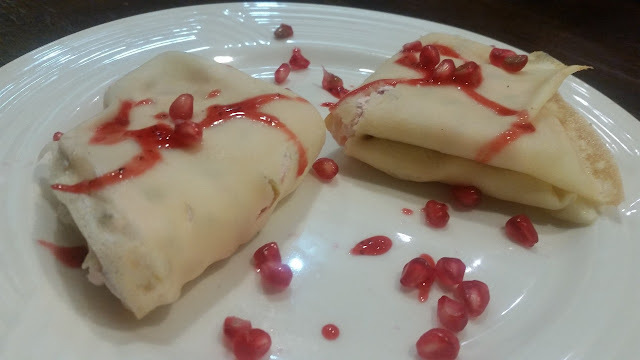 We finished our meal with Sweet Bliny, a pancake stuffed with sweet cream and fruits. I am sure we had just scraped the surface of Russian cuisine and there is much more depth in the number and varieties of dishes. The vast country stretching from the Caucasus to Siberia will naturally have a lot of variations in the food practices. I was once told by a friend that Russian cuisine used to be very flamboyant in the pre-Soviet era, and subsequently, due to lack of availability of many ingredients during the control-obsessed communist regimes, simplification had taken place in a lot of their recipes. Post the Soviet era the celebrations around food has started again, with bringing back lost recipes and contemporization of many dishes. 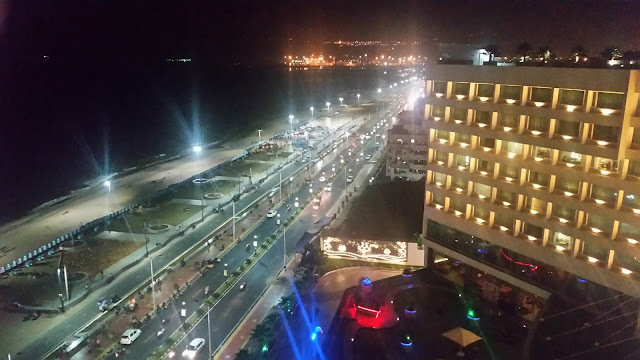 My feel from the limited exposure that I had here is that the cuisine can become quite popular among the food lovers in India if it is marketed well. 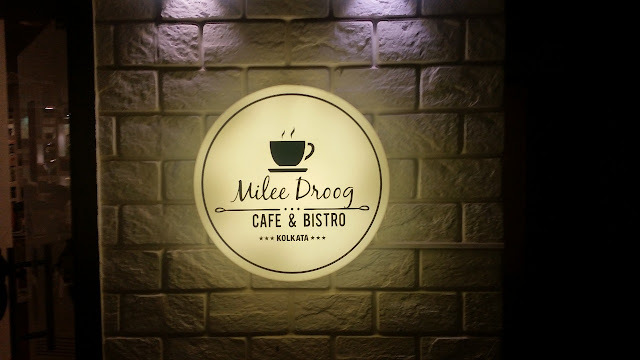 Pricing is comfortable at Milee Droog, with the most expensive dish on the Russian menu being priced at Rs 360. 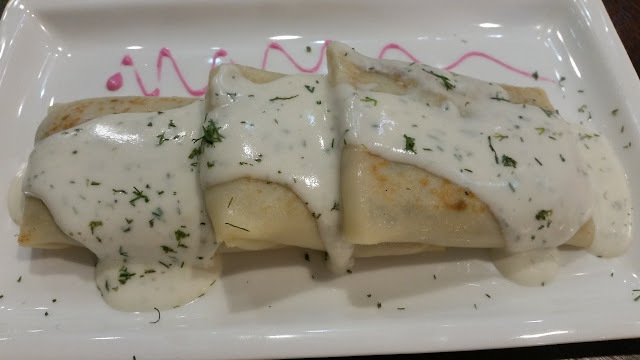 I hope that with the interest generated in uncommon cuisines in the city, they expand the number of Russian items on the menu, giving the customer many more choices to enjoy Russian food. 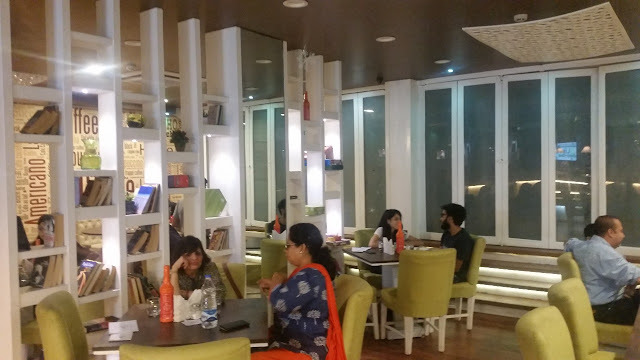 It is a place recommended for anyone who has interest in trying out diverse cuisines with an open mind.